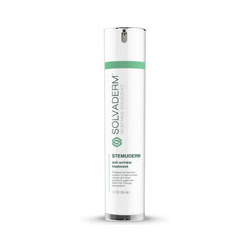 Stemuderm is a product that is part of Solvaderm’s complete anti-aging range. It is specifically designed to improve the look of the skin by lessening the depth of wrinkles and lines while smoothing and toning the face, neck and surrounding area. The manufacturer is a highly regarded producer of powerful, effective treatments that are suitable for people of all ages and skin types. Their website offers advice on choosing the right products and provides a free online consultation to consumers. In addition to this, there is a secure ordering section and information about the manufacturing process and company philosophy. Stemuderm is backed up by a 60-day money back guarantee. The company also provides a 10% discount coupon and free shipping on certain orders. Stemuderm uses a blend of peptides, stem cells, and hydrating ingredients to drastically reduce wrinkles, lines and other signs of aging while also strengthening the skin’s matrix, making it able to withstand further damage. Used over time, the product restores the skin’s elasticity, making it more supple and less likely to form wrinkles. It also relaxes facial muscles, making them contract less to further prevent the formation of lines, especially around the eyes and mouth. The product is to be used as part of the regular skincare routine, applied twice a day after cleansing. Because the formula is so potent, the manufacturer recommends that it is applied every other day for the first week in order for the skin to become used to it and cut down the risk of irritation. Stemuderm contains a number of ingredients that are all listed on the product website, although ingredient amounts are not disclosed. The main muscle-relaxing substances include a number of peptides such as Acetyl Hexapeptide-8 and Acetyl Glutamyl Hepapeptide plus Syn-Ake, a synthetic form of snake venom that ‘freezes’ facial muscles. For deep hydration, Stemuderm uses Squalane and Hyaluronic Acid which both help the skin cell retain water, plumping them to give the face fullness. Malus Domestica Fruit Cell Culture contains stem cells that have been proven to effectively increase the longevity of aging skin cell while also healing and repairing the damage. Finally, two oils are added, Jojoba and Apricot, both of which smooth and moisturize, restoring the skin’s natural oil levels. Stemuderm is a great addition to any anti-aging skincare routine and contains all the ingredients needed to fight signs of aging. It has many benefits and not only decreases lines and wrinkles but helps strengthen the skin at a cellular level, preventing more damage from occurring. Stemuderm’s one bottle is long lasting and ultimately, the fact it is such high quality definitely justifies the price. I tried a lot of different things to try and firm up my skin. I tried facial exercises, different products, changing my diet—you name it. Nothing helped. Finally, I found Stemuderm and I wish I’d found it sooner. It’s really helped firm up my saggy skin and I feel a lot younger looking. I don’t exactly know if I look it, but I feel it, so that is what counts!